I've had my iPhone for a month or so now and it has changed me! Sounds dramatic I know, but I think it has. I must confess - I love my iPhone. My previous phone was a HTC Touch - a powerful Windows mobile with everything I needed - email, Internet, calendar. So I thought I didn't need an iPhone - no one needs an iPhone - but it has made my life so much easier. What makes the iPhone brilliant is the abundant supply of apps - apps for everything. Simple apps like Awesome Note, Calendar, the new Irish Times app, Evernote, Skype and the brilliant Quick Office make everyday easier, especially in work. When I'm bored I play Touch Physics or Angry Birds. When I want to be informed I click on the Guardian app, RTE News, the Telegraph, Treehugger or the ITN app. When I feel like connecting I open up Facebook, Tweetdeck or Blogpress. I'm never off the damn thing. And then there my role as a science teacher - oh yeah nearly forgot that - and the iPhone offers plenty to keep me occupied here too. 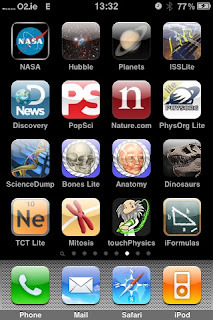 To be a good science teacher you need to be informed about what's happening in the world of science and there are plenty apps which let me do that. The picture over shows some of the science related apps on my iPhone, I emphasise the "some". NASA has become cool again (at least in my eyes anyway), the Hubble app mesmerises me with wonderful images from deep space, the Planets app has given me a sore neck from looking up at the night sky, Discovery News lets me know when a new frog species has been discovered (I'm kidding), Speed Anatomy makes sure I know my arms from my elbows and Science Dump contains brilliant videos from YouTube of scientific interest - all great. Then there is the amazing Sky+ app, which makes sure I will never forget to record that documentary on the BBC when I'm out again! The iPhone is here and here to stay. But it hasn't arrived empty handed - it has brought loads of wonderful apps to play with. Never to bored, misinformed or disorganised again!